The Department of Veterans Affairs has spent more than $408 million to install solar panels on its medical facilities in recent years, despite many of the projects experiencing significant delays and some of the systems not becoming operational at all. The VA has failed to effectively plan and manage these solar panel projects, resulting in significant delays and additional costs, according to a report released by the agency’s inspector general last week. The watchdog conducted an audit of 11 of the 15 solar projects awarded between fiscal years 2010 and 2013 that were still in progress as of May last year. The investigation, which was completed in March, found that only two of the 11 solar panel projects were fully completed. "This occurred because of planning errors, design changes, a lengthy interconnection process, and contractor delays," the inspector general concluded. "As a result, VA did not increase renewable energy for those solar projects in the time frame planned and incurred additional costs through needed contract modifications." The VA subsequently told the inspector general in July that five of the 11 projects had been fully completed and eight were generating solar power. Three of the planned systems, including one in Little Rock, Arkansas, that precipitated the investigation, still are not generating solar power at all. According to investigators, all of the projects were supposed to be finished in about seven to 12 months but instead were completed—or remain expected to be completed—on average, within 42 months. The contracts for the 11 projects reviewed by investigators totaled about $95 million, though some have become more expensive because of poor planning and delays. 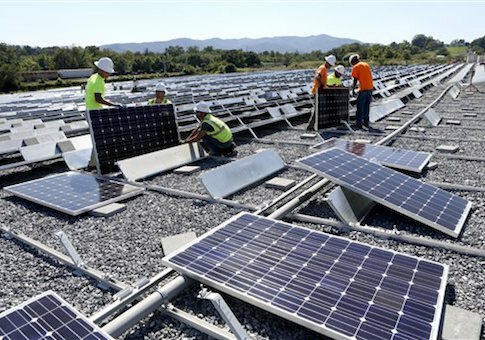 The VA spent more than $408 million on its "green management program" solar panel projects between fiscal years 2010 and 2015, according to annual budget records. During the same period, veterans died waiting for care at VA hospitals where employees were using dishonest record keeping practices to conceal long waits for care. The inspector general initiated the investigation at the request of Arkansas Sens. John Boozman and French Hill, both Republicans, who asked the watchdog to examine a significantly delayed $8 million solar panel project at the John L. McClellan Memorial Veterans Hospital in Little Rock last April. The project, begun in 2012, has been delayed more than four years beyond its original planned completion date and will cost taxpayers an additional $1.5 million. The VA spent millions to install the solar panels at the Little Rock facility in 2013, only to remove and reinstall them two years later to accommodate a new parking garage. To add to problems, the panels were never turned on because they were incompatible with the local electric grid. The VA has set aside nearly $1 million to disassemble and reassemble the panels and will spend roughly $350,000 on changes to the equipment, according to the audit. "The Little Rock officials did not effectively plan the installation of the system and a determination regarding whether expected solar power generation was achieved could not be made as the system has yet to be activated," the inspector general wrote. "The project experienced significant delays and additional contract costs due to disassembly of previously installed solar panel carport structures to accommodate a parking garage. In addition, a lengthy interconnection agreement process with the local private utility and contractor performance issues added to the delays." The VA said the watchdog was "biased" in its review because the audit only covered solar panel projects that were in progress during the scope period and not those that had been completed, according to the report. VA officials also said that the Little Rock project was "complex" because of the planned parking garage construction, which was approved and finalized after the solar panel contract was awarded. Both Boozman and Hill called for increased oversight of VA green management programs in the future to avoid failures. "Whether it is a project as complex as hospital construction or one as simple as the proper installation of solar panels, VA continues to waste large amounts of taxpayer funds as a result of its own ineptitude," Hill said in a statement. The VA has been under fire for wasting federal dollars as veterans’ wait times and other failings have persisted at the agency’s network of medical facilities. A recent investigation by Open the Books and COX Media revealed that the VA spent $20 million on artwork over the last decade, outraging members of Congress.